The 1 Passage You Need To Read To Understand Donald Trump's Appeal : It's All Politics Trump gave a speech with few policy specifics, but that's not the point at all. He's channeling how a swath of people feel, and nothing sums it up better than 178 words he uttered. Republican presidential candidate Donald Trump speaks during a campaign event Tuesday aboard the USS Iowa battleship in Los Angeles. 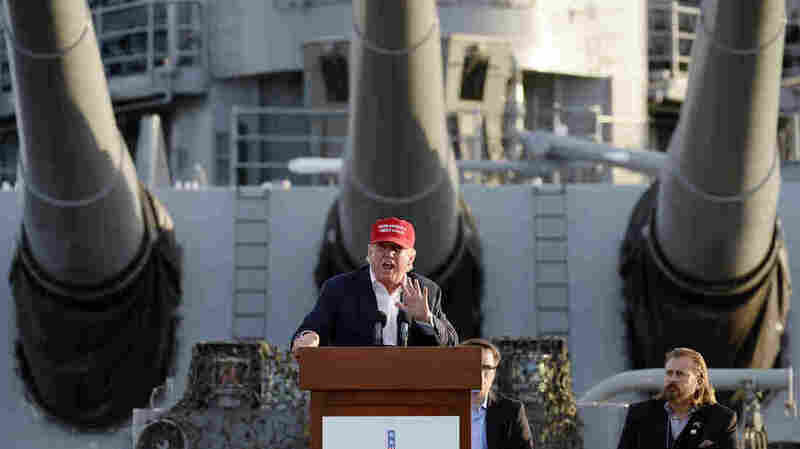 Donald Trump went and gave a speech Tuesday night on the deck of a battleship, the appropriately named USS Iowa. Reporters were expecting a policy speech. What followed was not that at all. Trump promised to "create a whole new system" and to "take the system apart." He said under a President Trump, veterans would be allowed to go to private hospitals and see private doctors and be reimbursed. He said it would be the "greatest service." Of his potential plan, he added, "That's gonna be broken down into something very special." Trump again said he'd build a border wall and make Mexico pay for it. He hit China, though he loves it for buying apartments from him. He brought Japan and the cars it sells to the U.S. into the mix. ("And we sell them beef," Trump said, mocking the U.S. trade relationship with Japan.) There was the Iran deal ("the dumbest"), a rumor about John Kerry possibly running for president ("no chance"), and, of course, Hillary Clinton (the "worst" secretary of state ever, who also has "no chance"). "The 'silent majority' believe me is back, and I think we can use it somewhat differently. I don't think we have to call it a silent majority anymore, because they're not silent. People are not silent. "They're disgusted with our incompetent politicians. "They're disgusted with the people who are giving our country away. "They're disgusted when they tell the border-patrol agents, who are good people and can do the job — they're disgusted when they allow the people to just walk right in front of them, and they're standing there helpless, and people just pour into the country. "They're disgusted when a woman who's nine months pregnant walks across the border, has a baby, and you have to take care of that baby for the next 85 years. "They're disgusted by what's happening to our country. And you're going to look around. You're going to remember who the people are that are here, because we're doing something special. "This is a movement. We're going to make our country great again — believe me. We will make our country great again." It's the message that's breaking through, delivered in a way only Donald Trump can deliver it. He's speaking clearly, forcefully and unambiguously to the GOP base and channeling voter frustration in a way none of the other candidates have quite figured out how to do — certainly not with the gusto of Trump. "I think it was vintage Trump," Michael O'Hanlon, a senior fellow at the Brookings Institution, told NPR's Don Gonyea. "It wasn't a defense-policy speech the way we've come to think of them in the modern presidential campaign era. There were no specifics on really anything." But, he added, "One thing American voters are signaling to the political establishment and the policy establishment working in Washington is that maybe they don't care. ... Maybe the voters are saying this is a whole different election. Maybe they're saying, 'It's just too early, gosh darn it, give us a break.' "
But Trump's supporters aren't with him because they want to hear the wonky details. They want someone to channel what they feel. And, right now, no one's doing that better than Donald Trump.